An unique and original event, never done in Shanghai before. Two strong and influent artists, devoted to their passion and Dance will Bring You Energy, vitality and Love during these Two Hours Workshop ! Based on the idea that Pilates is One of the best warm-up and Preparation to get the Body trained to Dance, The Workshop will be The Perfect Occasion to demonstrate How PILATES JEY’S METHOD can be an efficient tool to know your body’s function and make it move properly without any risk of injury. PILATES is One of the Best Technique to muscles and train the whole body, gently – no chock for the body – no injury – no violent movement that can hurt your self and shake the body badly. SALSA : Don’t even need to be described anymore. The Most Popular and Sensual Dance of Latin Countries : is one of the most popular and sensual dance in the world. The two technics combined for a perfect balance between core strength improvement and funny basic latin dance steps. The first hour of the workshop will be dedicated to Aerobic Warm-up (light weight and Tonic Movements on Music-) Pilates Mat technique. During this hour you will discover your core strength, wake up your abs and deep muscles, stretch your body and get ready to dance! The second hour will be an introduction to Salsa Dance including basic steps, turns and partnering. 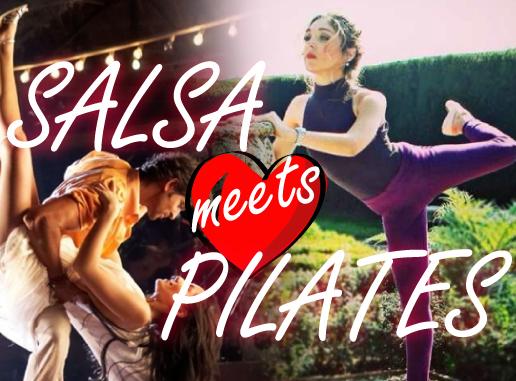 (If Only Girls, our Salsa teacher will adapt his class and Make only Girls Steps Teaching combine with Latin Dance – Fun – Entertaining and Sensual Steps-) Complemented with Salsa Music ! The workshop is for beginner to intermediate level – accessible to anybody who would like to dance and move- No need To be professional Dancer- or even Regular Dance – and will be conducted in English/French.